On the eve of his retirement after 36 years with the University of California, expert olive oil taster, international consultant and NYIOOC judge Paul Vossen spoke with Curtis Cord about olive oil production, tasting techniques and his work with farmers in every region of the olive-growing world. Curtis CordThe renowned olive oil expert Paul Vossen recently retired after thirty-six years with the University of California Cooperative Extension as a farm advisor in Sonoma and Marin Counties where he also managed the first olive oil taste panel in the US to become recognized by the International Olive Council. These days, he’s an international consultant in olive oil production processing and sensory evaluation and a judge at the New York International Olive Oil Competition where he served as its panel leader in 2014. Welcome, Paul. Paul VossenThanks, thank you very much. Actually, you said I was retired, I have twenty-nine working days left. Curtis CordWell, make the most of them. Paul VossenNot that I’m counting. Curtis CordAre you one of those people who’s going to retire just to find yourself even busier than you were before? Paul VossenYeah, probably. I’ve already got a lot of consulting gigs lined up, I’m going to be doing some travelling, plans to go over to Albania and working with a USAID project in Albania trying to help them produce a higher quality olive oil. I’m going to be teaching a three day processing course there, and then in October, there’s an international meeting, International Society of Horticulture has a symposium every four years and this year it’s in Croatia. Anyway, yes, I’m going to be doing a lot of different things. One of the other things about my job as a public employee with the University of California is that I really haven’t been able to do very much consulting within California. We have several hundred producers in California, so I should be able to do a little bit more private consulting now right here in California, too. Curtis CordWhat do you do when you go to these consulting gigs, as you put it? Paul VossenI’m primarily a horticulturist, so one of the first things I do is go take a look at their orchards and see what they’re doing right, maybe some of the problems, what I might be able to help them with. We’ll look at the varieties, and the spacing, and the pruning, and the nutrition, and the irrigation, and then of course evaluate the quality of the fruit. One of the other problems that we have here in California is olive fruit fly, and so a number of producers have been struggling with how to control that insect. Of course, if you’ve got all the fruit fly damage, that really negatively affects olive oil quality, so pretty hard to produce high quality olive oil when you’ve got olive fruit fly damage. Those are some of the things I help them with, and then I also have quite a bit of expertise in olive oil processing. I’ve been working on that for quite a while. I’ve done a number of experiments here in California evaluating processing systems, so I’ll help people with making decisions on fineness of the paste, malaxation time and temperature, whether to use any adjuvants like talc or enzymes and the effects that those might have, essentially how to produce the best quality olive oil they possibly can with the olives that they have. Then, of course, as you stated in the introduction, I’m an expert taster, so usually we’ll sit down with people and taste their oils, help them decide how to store their oils, where to store them, so that they make sure they’re not blending something in a storage tank that’s going to diminish the quality, help them with their blends a little bit later on after the oils settle a little bit. You know, it’s kind of a full-fledged assistance to try and help them produce the highest quality olive oil possible. Curtis CordI also noticed you wrote a book on organic farming. Is a lot of your consultation focused on that? Paul VossenI do a little of both. There’s been quite a bit of interest in organic production, and we have focused for years, and years, and years on production issues that weren’t centered or didn’t really take into account the laws and regulations regarding organic production, organic certification. When you begin to start to look at some of the details of producing things organically, you’re limited in the types of fertilizers you can use, you’re certainly limited in any of the pesticides, and when I say the word pesticide people automatically think some toxic substance, but there are a lot of pesticides and things that just kill pests that are also organic. Things like minerals, and soaps, and some oils and things like that. We look at what can be done within the organic certification process, and of course, the whole overall orchard management system, as well. Within the processing area, organic basically just means you can’t have something go through conventional and then follow it with organic without completely cleaning the whole mill, the whole processing system. Yeah, I do a lot of work with organic producers, but I also do a lot of work with conventional producers, as well. Curtis CordOut in California, are they overwhelmingly organic? Paul VossenThe number of producers are overwhelmingly organic, but the volume is overwhelmingly conventional. As most of our big growers are not organic producers, but most of our producers in number, and they’re small scale, are organic. It’s about seventy percent in number organic. Curtis CordAre there efforts under way by those larger producers to go organic, or not really yet? Paul VossenNot really yet. You know one of the interesting things about organic olive oil is that it has an advantage in the market place really only from the standpoint of if there were two competing products side by side somewhere at about the same price, then the organic one has an advantage. You already have these gourmet, specialty olive oils at such a high price that you really can’t add on much of a price to an organic product and expect to get it without having a negative effect just from the price standpoint. From that, you really don’t have much of an economic advantage in being organic, especially because growing things organically is more expensive. The two primary problems in growing something organically are weed control, in the case of olive fruit fly, controlling olive fruit fly organically, but it’s really mostly weed control. Also, excuse me, nutrition is one of the key factors. You can’t use conventional fertilizers and you can’t use conventional herbicides. You’ve got to mechanically control weeds or smother the weeds with mulch or something like that, and then the fertilizers, you’re limited to organic products, either concentrated organic products or compost or things like that. Those are just more expensive to buy and to move around and to apply. Curtis CordYou’re consulting mills and farms and producers has taken you to some pretty out of the way places, hasn’t it? Paul VossenYes, I’ve been all over the world, just about every other place that grows olives, I have visited, including Iraq. Actually, the US government hired me to go over to Iraq and I went twice and helped some of the Iraqi farmers with some decisions that they were looking at, and also the US government had installed a couple of mills there. What’s interesting is that farmers are farmers. Everywhere in the world, they’re good people. You go out to the field and stand there and look at their orchards or help them in the mills and they all have about the same questions. How should I prune these trees? How much water do they need? What are my options for fertilizing? When should I harvest? Things like that, so it’s pretty universal, it’s just a little bit difficult getting there sometimes. Curtis CordThe questions might be the same, but the answers are different, aren’t they, taking into account where they are, and climatic conditions? Paul VossenYeah, I think one of the biggest differences you see, particularly in the Old World, is that olives traditionally were grown in places where you really couldn’t grow other things. You wouldn’t plant olives, for example, along the river bottoms where you might have irrigation water and you could grow other tree crops, or vegetables, or something that’s actually of a higher value. Where people grew olives were on the hillsides where irrigation water wasn’t available, where you might substitute crop like wheat, or sorghum, or something like that, that’s an annual crop and you’d come in and plant olives. One of the interesting things that’s happened really over the last thirty years, especially with drip irrigation, people began to irrigate olives, and as soon as you irrigate olives, you can tremendously increase production four or five times the amount of fruit can be produced from an irrigated orchard versus a dry-farmed orchard. It depends on how deep the soil is and how much rainfall you get, and those kinds of things, also. That really is one of the main questions that I get is how do I set up a drip irrigation system, how many lines do I need, spacing of the emitters, how often do we let it run, and often do we run it, every day, every other day, et cetera, et cetera. That’s kind of a universal question all over the place. Managing irrigation is one of the most important things you can do in an olive orchard, not only from the standpoint of increasing production, but also from the standpoint of oil quality. We’ve done some research work here, and others have followed up with similar research, where we’ve compared irrigating trees at different amounts all the way from a hundred percent of what the trees could possibly use down to fifteen percent of what the trees could possibly use, and we see quite a difference in tree growth, production, and we also see a huge difference in the quality of the oil that’s produced from those olives. If you give olive trees anything above about seventy percent of what they could use, you’re going to end up with a fairly bland olive oil because the olives are so pumped up with water, and most of the flavor components in olive oil, or in an olive, are water soluble. When you have some of these diluted out olives, you ended up with diluted out olive oil. Curtis CordIs that the same thing with wine? Curtis CordWe hear about stressing the grapes, or stressing the olives. Is that the case where the quality is enhanced? Paul VossenYes. If you talk to viticulturists, one of their main objectives is monitoring and managing the vigor in their vineyards, so yeah, that’s very important. You can’t have pumped up wine grapes, either, or you’re going to end up with bland wine. Curtis CordIn California, there are some groves that don’t irrigate at all, or very little. Curtis CordOne that comes to mind is Berkeley Olive Groves. Paul VossenYes, and I noticed they’ve won several awards, I think they won three, yeah, no they won four awards at New York. Yeah, I’ve known them for quite a while, that’s a really interesting story. That ranch was originally started by some professors at Berkeley that were looking for an alternative investment, and they bought this property up there, planted the olives, and then it, I don’t know, fell apart, I’m not sure exactly what happened, but the land came up for sale and it was purchased and rejuvenated. I’ve actually consulted with the owner a couple of times about how to manage those trees. Yeah, what brings out those intense flavors in olives is making sure that you don’t have fruit that’s all pumped up with too much water. Curtis CordYeah, Paul, you and I have spoken about this before, but one of the things many of us wanted to see this year at the New York competition was better results for Greece, but the success rate has slipped even further. Paul VossenWell, first of all, I noticed there at least were a few nice olive oils from Greece. They had several winners, including two Best of Class oils, so it’s not that they can’t produce fantastic olive oils because there are some producers in Greece that are producing fantastic olive oils, but Greece has a number of problems. Just inherently, the country is not as rich, not as wealthy as some of the other European countries. Everybody knows they’ve got economic problems. Then, that’s coupled with sort of a tradition, really a long tradition of the way they’ve produced things there in the past. I’ve been to Greece several times and worked with a number of producers there. They just don’t handle the fruit as carefully as some other places. It’s very common to see harvest down onto the ground, that they pick the fruit up and put it into bags, pile the bags up onto trailers, move that fruit not very quickly to the mill, there’s a lag time period there so you begin to get some fermentation. I’ve also seen instances where olive fruit fly wasn’t controlled adequately, and other instances where the mills just weren’t cleaned properly in between batches. You could have a fantastic set of olives come in, or some producer brings this fantastic olives in, but if the mill isn’t completely clean, and I’m talking about pretty much taking it apart and opening up all of the tubes, and the pipes, and the pumps, and everything to completely clean it, because you have a residual of product left over in one of these large processing plants that could contaminate the next oil that’s going through. These competitions, like the competition in New York, we’re looking for the absolute best olive oils, and the judges segregate out any oil that has any slight defect whatsoever. It’s got to be fresh tasting, it can’t be tired, you can’t have any residual contaminations, even slight defects. When you’re trying to win an award at a competition like this, you better do absolutely everything right in order to be able to have that pristine olive oil, that ultra premium or super premium olive oil, otherwise it’s just not going to cut it. Curtis CordYeah, one out of every nine Greek entries, to be exact, was awarded at this competition. I know that we’ve also talked about the Koroneiki variety and I know that you can taste the Koroneiki, I know that the other judges know what a Koroneiki tastes like. Do you think there’s anything inherent in the Koroneiki variety that makes it less appealing to judges? And also, do you recall a predominant defect that was detected along with the Koroneiki samples? Paul VossenOn the contrary, Koroneiki is a fantastic variety. It has some wonderful characteristics. It tends to be very fruity, can have, depending on the maturity at harvest, tends to have tropical fruit flavors, people associate banana, the green banana or ripe banana with Koroneiki, but it also has a lot of other very interesting tropical fruit flavors. It is nicely bitter, nicely pungent, spicy, green, herbaceous, I can go on and on. If a Koroneiki is harvested at the peak of maturity where it’s got just a little bit of color, and handled very, very carefully after harvest, it produces and can produce absolutely fabulous olive oil. It’s not the variety. It is really the way that the fruit is handled within the entire process all the way from olive fruit fly damage, to pristine equipment and temperature control and all those different kinds of things within the processing. One of the things we tend to see with Greek olive oils is this sort of residual from dirty processing equipment. Again, I talked about it earlier, it’s just keeping everything absolutely pristine clean, which means starting with clean equipment in the fall, so generally what has to happen is people have to take that equipment apart at the end of the year, completely clean it. At the beginning of the harvest season, bring in totally perfect fruit that’s harvested from the tree, not from the ground, no olive fly damage, perfect ripeness, and run that fruit through, and essentially don’t stop the equipment, run it for twenty-four hours a day, and process that fruit in an immaculate state, and then store it properly, of course, in tanks, et cetera, et cetera. If that’s done, and you’ll see the people that won awards, gold awards or Best of Class awards, that’s what they do. There’s a tradition. If you go to Greece or you go to various places, particularly in the Old World, there’s a tradition of production that’s been left over from at least hundreds, maybe even thousands of years of the way they used to do it. One of the things that’s happened from that is that people have developed a familiarity with those flavors. One of the most frustrating things as an olive oil consultant and a judge, when you’re sitting there talking to producers and tell them that their oil is defective, they say well, what are you talking about? This is the way we’ve made oil for the last however many years, maybe generations, and these are the flavors that we like, and the flavors that we love. It very often, the flavors that they like and the flavors that they love are defects in the oil that have come about from poor handling, olive fruit fly damage, et cetera, et cetera. It’s no secret, if you look at the history of olive oil production, and we’re looking at at least five, six thousand years, and probably even longer, how long have we had electricity, well, not that long, so the modern system where we bring high quality fruit in, it’s deposited, it runs through the mill and runs through a stainless steel horizontal centrifuge and a stainless steel vertical centrifuge, and is stored in stainless steel never touched by human hands, going through that process all in about forty-five minutes to an hour, that’s a new thing. You look at the old system where the roads weren’t very good, how do you get one of these green marbles or little colored marbles off the tree anyway, well you let them fall on the ground because they’re so hard to pick, it costs a lot to pick them, so they fall on the ground, they sit there for a while, they start to oxidize, they rot, there’s olive fly damage, doesn’t get to the mill very quickly, and the mill was what, it was maybe a stone that was pushed around in a circle by a mule or an ox or something like that. Just the whole process was completely different, and it produced oil, and people consumed that oil and they liked those flavors. One of the flavors that people continue to like is fermentation. Curtis CordYou’ve been doing this for thirty-six, at least thirty-six years, how long has this knowledge been around, how to produce high quality olive oil like that? Paul VossenI’m just going to throw a number out, but something like forty to fifty years. It’s not unlike you use the analogy of wine a little while ago. White wines for many, many years weren’t very good, and one of the reasons is because the flavors of white wines are much more subtle than the flavors in red wines. We really have only had these fantastically light, subtle, fruity white wines since we began to use temperature control in fermentation. When you control the temperature of fermentation, you don’t allow the wine to heat up, which is what it naturally does during fermentation, and when it heats up it volatilizes off a lot of those really interesting aromatics. Same thing with olives, as I described earlier. We bring in very high quality fruit without any damage, and process it very quickly at a low temperature, manipulate the time and temperature of the malaxation, the crushing process, so we don’t heat the paste up, and then extract that essence from that fruit, that’s really only been around for a very short period of time. Curtis CordWhich is not very long against the backdrop of a thousand year old traditional way of making something. Curtis CordWe didn’t get to chat in New York very much at the award celebration, but there was a lot of energy in that room. Paul VossenOne of the fantastic things about the New York competition, first of all it’s huge, so you get really interesting entries from all over the world. Everybody wants to win at New York because the US is a huge market, so people want to sell their olive oil on the US market. The other big thing is the promotional efforts and the prestige that is garnered by winning an award in New York. You can just see it by going to your website, and then of course the awards ceremonies and things like that where producers are really given a lot of recognition for what they do. This is not often the case. A lot of these other competitions, they get an award and nobody ever hears about it. Not so with New York, so that’s one of the reasons why people really like the New York competition. Curtis CordYeah, did you get to talk to other people in the room? Paul VossenYeah, there’s a lot of excitement … When somebody wins an award at New York, they’re just absolutely blown away by how wonderful it is. They’re just pleased to no end of being able to win some type of an award from New York, whether it’s silver, or gold, or Best in Class. A silver award from New York is good, too. I’ve been a judge in a lot of different places around the world, and the New York competition is really nice for a couple of things. One of the things that I like about, also, is that you separate out the Northern Hemisphere and Southern Hemisphere. They’re judged at the same time, but it really is unfair to judge them against each other because you’re looking at six months difference in harvest time. If you judge at one time of the year, the Southern Hemisphere oils are not going to be as fresh, and if you judge at another time of the year, the Northern Hemisphere oils aren’t going to be quite as fresh. That’s one of the things I really like about the New York competition, as well. Curtis CordWe’re finding that some of the Southern Hemisphere producers are harvesting just before they send it. Paul VossenThat’s happened in a number of competitions, as well. That’s one of the reasons why you’d like to separate the awards out. Curtis CordA couple of weeks could make a huge difference. Curtis CordFor example, if they’re in a place where they can’t harvest in March, it simply can’t be done. I would imagine that there are places in the Southern Hemisphere, for example, where you can not harvest in March. Is that true? Paul VossenThat’s true, or if you do harvest in March, you’re going to end up with olives that are so green and bitter and pungent that they wouldn’t win an award anyway because they’d be so out of balance. You’ve got to have at least a certain level of maturity before you can make a decent oil out of it. Curtis CordThere are going to be some producers who simply can’t participate because they don’t harvest in time to send it off in April, in early April. Paul VossenRight, or they essentially got last year’s oil, so now you’ve got an oil that’s eleven months old. That’s hard to compete with a fresh product for something that’s eight, nine, ten, eleven months old. Curtis CordThis year it’s a little later, it’s more towards late April, so hopefully we’ll bring more of those producers in. Paul VossenThat’s a good time for Northern Hemisphere oils, as well. A lot of those oils are harvested in, probably the earliest ones would be September, but a lot of them are harvested in October, November. They go into settling tanks and have a chance to mellow out, but they’re still quite fresh, so there really isn’t any problem with evaluating those oils at that time of the year. Curtis CordHow do you look back at thirty-six years at the University of California Cooperative Extension? Paul VossenIt’s a great job in that I’ve had the ability to, from the standpoint of academic freedom within the university system, be able to pick and choose some of the projects I wanted to work on. I’ve done a number of things, I did quite a bit of work here in this local area with specialty crops producers, helping people grow berries, and gourmet apples. I was one of the first people to grow heirloom tomatoes in the United States, things like that that have been success stories. We had a lot of small scale producers that are producing some fantastic products here right now. When I look back on it, some of my greatest memories really are working, though, with olive oil, and I think one of my best accomplishments was getting this olive oil taste panel started. I went on sabbatical leave in 1996 and went to Europe, and the Italians and the Spanish and the Greeks, but primarily the Italians at that time were doing a lot of olive oil tasting. I tasted a lot of olive oils with them and learned about tasting olive oils, and then they were using those tasting notes and describing olive oils in ways that nobody had ever really described olive oils before. Most of the people were talking about well, this is a good olive oil, and this is a medium olive oil, and this is a not so good olive oil, but really to sit down and talk about the specific characteristics of why you might rate them that way was something foreign to a lot of people. I came back and started a taste panel here in California and there were a number of producers here that were producing olive oils, and really they had no idea whether they were producing a good olive oil or not. In fact, in some cases they weren’t producing a very good olive oil. I remember one of the producers we had here had an old press, and he was producing olive oils that had the defects of aerobic fermentation from a press, from the mats, and everybody was thinking how wonderful it was when it really wasn’t very wonderful. Probably the legacy of people being able to produce gourmet olive oils in the United States came from that taste panel, because we started tasting olive oils, the taste panel members were members of the industry, were part of the industry, and people started talking about flavors in olive oils, and how do you produce a better olive oil. What’s a good one? How does bitterness and pungency enter into the positive characteristics of olive oil? The fruitiness, the herbaceousness, and the spiciness, and the freshness, or the ripe characteristics. I’ve started teaching courses in sensory evaluation through the university, and I would say ninety percent probably of the producers in California have taken that course. Some cases, they’ve taken it more than once. They went back and they started really looking at how they handled that fruit, when they were harvesting it, how they were processing it and storing it, and I’m proud to say that I think that that greatly influenced the quality of olive oils coming out of California. I think part of that is the producer’s knowledge of what an olive oil should be. The only way they would know what an olive oil should be is to be able to taste them and learn from sensory evaluation. 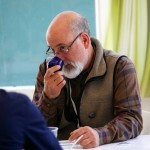 Curtis CordSpeaking of sensory evaluation, I was wondering if you had a personal technique when you sit down to taste so many oils? Paul VossenIt can really blow you away. That’s one technique. Tilt your head down just a little bit, slurp like that, get some air into the oil, and then I swallow it and then get the retronasal effect, and then evaluate it. Of course, years, and years, and years of experience in tasting oils, you can tell pretty quickly what you’ve got there. Curtis CordHow important is the retronasal effect? Paul VossenIt’s huge. It’s part of the taste. It’s really integral in the taste part of it in your mouth. When I say taste, actually we smell olive oils. The taste would give us bitterness and pungency. All of the other flavors that we associate, the characteristics that we identify with olive oils, the ripe fruit flavors, the green grassiness, the cinnamon, the nettles, whatever other herbs, those different types of things, if you put a name to it, a fruit, a berry, a apple, banana, those types of things, that’s all smell. That retronasal is very, very important. Same thing with the defects. When the fussiness and fermentations and rancidity, those things, you don’t taste that. That’s all smell, so it takes a good nose. I was just going over the list here of some of the different olive oils that won awards in New York. I’m really happy to see what the Croatians have done. I’m not surprised with what the Australians have done. I’ve never been to Croatia, that’s kind of why I’m … I’ve been to Albania, for example, so Albania’s got a lot of problems. I think of Croatia like Albania, but I’m hoping to get to Croatia this October and really see what they’re doing, but there were a number of awards from Croatia. Just absolutely fantastic. Curtis CordThere seems to be so much collaboration in Australia among the producers there. Curtis CordAnd now they’re part of your community out there in California. Paul VossenYes they are. Now we’ve got Boundary Bend USA, and we’re looking to see some good things from them. One of the most interesting that we’re going to see from them is the development of some medium-density orchards. Most of the production in California from a volume standpoint comes from these super high-density orchards, which are dominated by the Arbequina variety. Arbequina variety is a fantastic variety, but it produces a milder oil. When you’re looking at some of these other styles of olive oil where you get more bitterness and pungency and more spiciness, you really got to go to other varieties. When you go to other varieties, you can’t produce those varieties in that super high-density system, trying to keep the trees below nine to ten feet tall. You’ve got to go to the medium-density system and the Australians really have been the masters in developing that system. In the training programs that they use, spacing, getting the trees to come into production fairly early, compared to the big ole wide spacing that took eight, nine, ten years, they’ve been able to get pretty good production in four, five, six years. We’ve also done some work on that here in California. It’s a kind of an intermediated, I would call it a high-density system, or medium high-density system since your planting trees something like eight by sixteen spacing and getting some yields in the third year, by the fifth year you’re in full production, and then harvesting that fruit with an over-the-row mechanical harvester. Of course, when you do that you can harvest that, get that to the mill very quickly, and produce some fantastic oils with these other varieties, Hojiblanca, and Picual, and Coratina, and really any variety. Now you’ve open the door to all these other really interesting, wonderful flavors. That’s really kind of the signature, what Boundary Bend and Cobram Estates brand has done in Australia. Curtis CordVery well, twenty winners out of forty-five entries. Paul VossenYeah, and I think that’s better than they’ve ever done. I’ve been to Portugal and there’s a lot of old tradition in Portugal. Portugal’s one of the less wealthy of the European countries, and they’ve really taken this whole idea of producing super premium, very high quality olive oils to task. Italy is traditionally been the country that’s produced and has a reputation of producing these super premium, wonderful olive oils. If you look at the number of oils that they’ve produced, certainly they rank as number one, and they’ve always been the country to emulate not only from the actual quality, but also the way they’ve promoted oils. You look at the Italians are just absolute masters in promoting the specialness of things. Curtis CordBetter selection in a gas station than most specialty stores in New York. Curtis CordThey want to do the right thing. Paul VossenThey want to do the right thing, they’ve been doing the wrong thing for years, and years, and years, and getting away with it. I used to, three or four years go, I could go down to the grocery store and pick just about any of the major supermarket brands, and take them and I would use them to show defects in the courses that I taught. Paul VossenI still can, but I generally have to buy two or three now and taste them ahead of time, whereas before I didn’t even have to do that. I just go buy any of them and they were all horrible. Now, there are some that are less bad than others, let’s put it that way. They still have a long way to go, but I really look forward to the day when maybe those same oils are still there, but instead of being labeled as extra virgin, they’re actually labeled what they are, which is virgin olive oils. There isn’t anything wrong with a virgin olive oil, it’s just not extra virgin, you just probably have to charge a little bit less money for it, or maybe charge the same amount of money for it and then charge more money for something that actually does meet the extra virgin quality status. Then I think we also really have to go to other ways of recognizing olive oils. I’m not sure what terminology to use. Some people have used ultra premium, there are different evaluation groups out there and different standards that people are talking about, but we kind of almost have to get beyond extra virgin, because the extra virgin standard is such a low standard that it doesn’t really mean very much. You just summarized what extra virgin means, it’s essentially an olive oil without an defects. How many things would we buy and describe it proudly as oh gee, this just doesn’t have a defect? Curtis CordIt has to have some nice qualities, too. I don’t know, I think extra virgin is enough, and then on top of that, then you can develop your own preferences for different producers, or different varieties, but I’d be happy with everything that says it’s extra virgin being extra virgin. Paul VossenThat’s certainly a start. We keep talking about that, but yes, if we could at least get that, then go beyond that so that you could go down to the shelf and if it says extra virgin, you’re buying it, you know you’re going to get something that’s not rancid and not fermented, and then you take it home and taste it, and use it, and you go oh boy, I really like this because it’s spicy, and herbaceous, and cinnamony, and it goes great on my salmon, or on my salad, or however I’m going to use it, rather than taking it home and going oh boy, this is rancid and fermented, and it was supposed to be extra virgin.